Keep in mind, of course that 2,710 is only the WEAK bounce line on the S&P and we need to clear AND HOLD all the bounce lines before the market is back in a truly bullish mode. While the 5% Rule™ protects us from jumping in and chasing false bottoms – after such a huge fall it's frustrating to sit on the sidelines while stocks recover. There's nothing like a nice sell-off when you're ready for it. 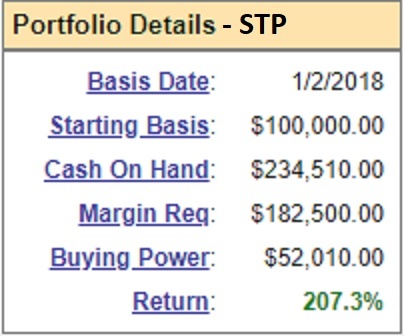 Yesterday's dip blasted our Short-Term Portfolio over the 200% line, up $207,272 for the year and up $23,088 (23%) since our 10/18 review as we briefly flipped more bullish for the bounce but then, since the bounce didn't make it over our Strong Bounce Levels, we doubled back down on our SQQQ hedges last week and turned ourselves back to bearish – just in time for this week's catastrophe. That was net $4,600 on the $60,000 spread and, unfortunately, we used Micron (MU), which turned around and fell 20% since then but, fortunately, we only promised to buy it for net $35.60 and it's now $34.60 so not a panic but those put contracts are now $12 ($12,000) so a bit of a drag but the S&P Ultra-Short (SDS) March $34s are now $7.50 ($75,000) and the $40s are now $4 ($40,000) so net $35,000 on the spread less $12,000 if we buy back the puts is $23,000 which is up $18,400 (400%), which is why the Short-Term Portfolio puts up such crazy gains in a pullback. http://welcome.philstockworld.com/wp-content/uploads/2015/09/PSW-Adooma-logo.png 0 0 Phil http://welcome.philstockworld.com/wp-content/uploads/2015/09/PSW-Adooma-logo.png Phil2018-10-30 12:31:072018-10-30 12:31:0710% Tuesday Correction – Have We Fallen Far Enough? So much fun to trade a volatile market. 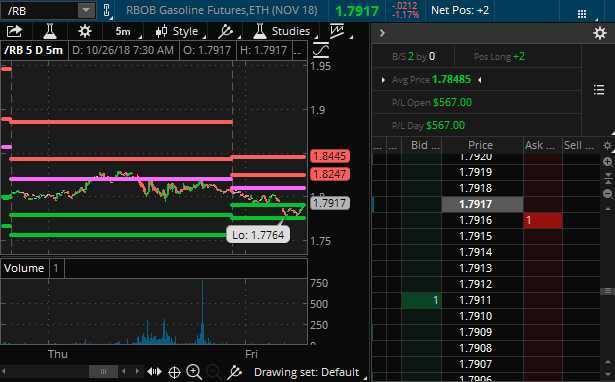 Already this morning (7:30) we picked a quick $1,000+ trading the Futures in our Live Member Chat Room and that's always a nice way to start the day but we stopped out Gasoline (/RB) with just over $200 per contract on a 15-minute trade and Oil (/CL) contributed $110 per contract and the indexes were good for a quict $150-250 each between 7:17 and 7:34. Well, we're re-testing Wednesday's lows so hopefully a little bounce here at 24,600 (/YM), 2,650 (/ES), 6,750 (/NQ) and 1,470 (/RTY) so I'd go long the laggard here but very tight stops below. Also /CL over the $66.50 line and /RB $1.785 are both fun longs for a Friday. Watch the Dollar though, we don't want to see it over 96.50 and VIX under 22 would be nice too! We've got GDP at 8:30 and last quarter was 4.2% and this quarter we'll be lucky to see 3.3% and it's likely to be downhill from here but the question is – has the drop to 3.3% been realistically priced into the market and, sadly, I don't think it has. Certainly any print below 3% would cause a new wave of panic and over 3.5% will be relief – so that's the zone we're keeping our eye on. This is exciting, isn't it? 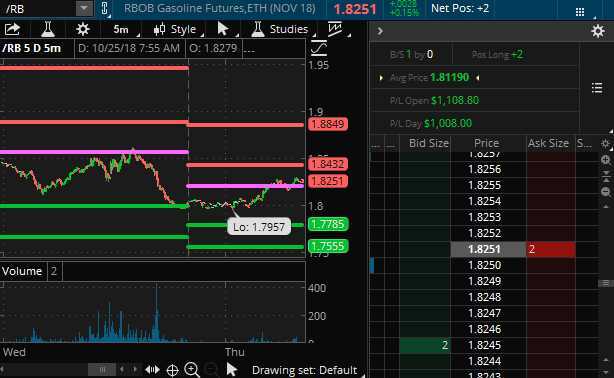 We had our Live Trading Webinar yesterday and our last Trade Idea was a long on Gasoline (/RB) at $1.82 with a planned double down at $1.80 for a hold into the weekend if we had to but already we're up $1,000 this morning and that, added to our quick trades on the Nasdaq (/NQ) and the Russell (/RTY) Futures during the webinar put us well over the $2,000 profit mark on our Futures Trades, which is just where we want to be with 2 hours' of "hard" work. The indexes were far too scary to trade overnight and, even this morning, I'm less than enthusiastic about the "rally" that's lifting the Dow (/YM) back to 24,800 because that's still 2,200 points (8%) down from 27,000 which means it is only a weak bounce (20% of the 10% drop) and we're not going to be impressed by anything less than getting back over the 25,300 mark, which is still 500 points away. 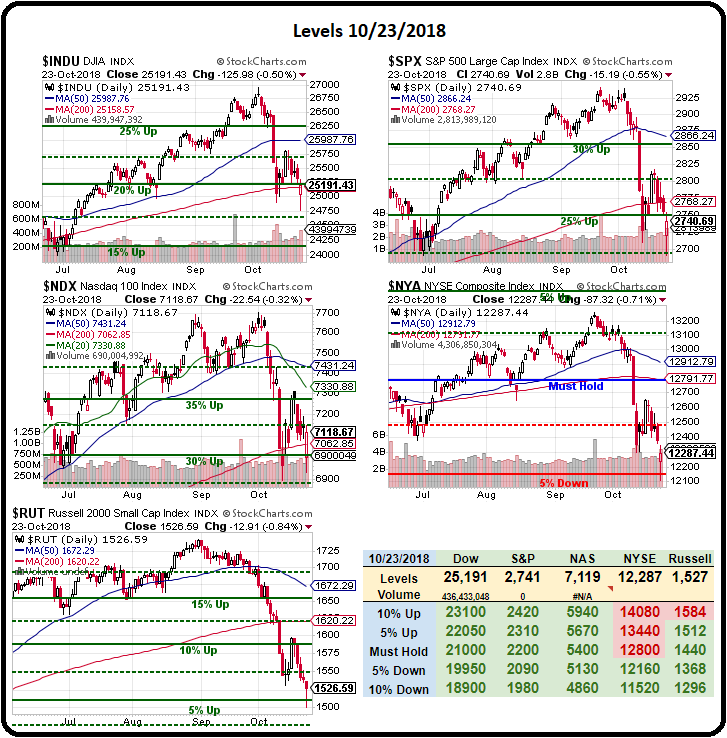 As you can see, the Dow and the Russell are right on their test lines so we can pretty much make our bets this morning depening on which way those two levels (1,530 and 25,300) break but we think the market is set to give the strong bounce lines a good try, which makes /RTY a good lagging bet if it breaks above 1,530, with very tight stops below because failure there would be a very bad sign for all the indexes (in which case we could short /YM below 25,300 with tight stops above). As you know, we love a good sell-off because we're very well-hedged but now we seem to be breaking even lower and we'll have to look at improving our hedges – just in case. 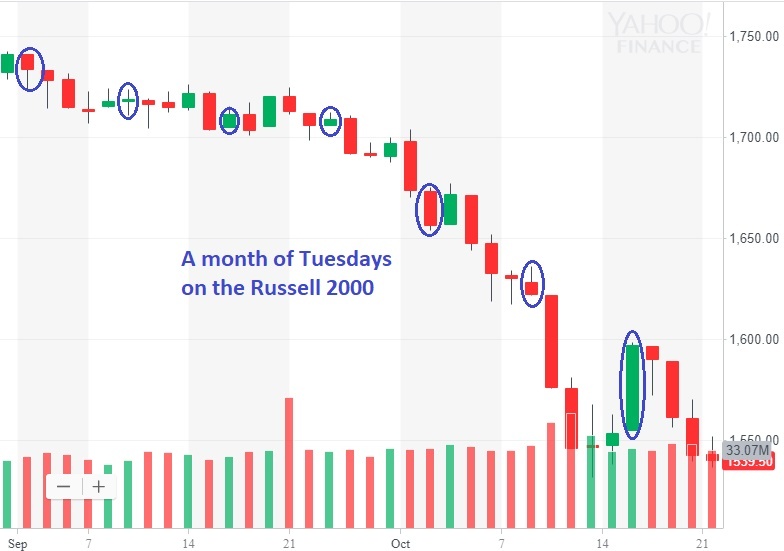 We are significantly lower than 10/9's Tumblin' Tuesday and 10/2 was "Tuesday – Trouble at 1,700 for the Russell" and we're miles from that now as we are almost down to 1,500 and Sept 25th our Morning Report was: "Toppy Tuesday – Markets Bounce Back Ahead of the Fed" after 9/18's "Tariffic Tuesday – Markets Ignore Another $200Bn Drag on Global Trade". Oh, and last Tuesday was: "Tempting Tuesday – Nothing has Changed but Markets Move Higher." Supporting the development of private enterprises is the Party Central Committee’s consistent policy." We also got a boost from Italy, whose rating was cut by Moody's but not all the way to junk, as expected – they are one notch above junk and have agreed to try again to submit a budget that's acceptable to the EU. On the home front – our own fealess leader has pledged to also make America a Capitalist Paradise but this weekend he also promised the Middle Class some super-secret tax cuts that no one in Congress seems to have any idea about – especially as he's promising them pre-election and Congress isn't even in session to pass them. When Congress does come back, they'll actually be working to avoid a Government shut-down as Trump's prolific spending has already broken the very generous debt ceiling and another cut would surely shatter it beyond repair. Rule #1 of government is that you don't run up deficits in a strong economy – that's when you are supposed to pay them down! If you never pay them down – what are you going to do the next time there's a crisis? Well, we made some progress. 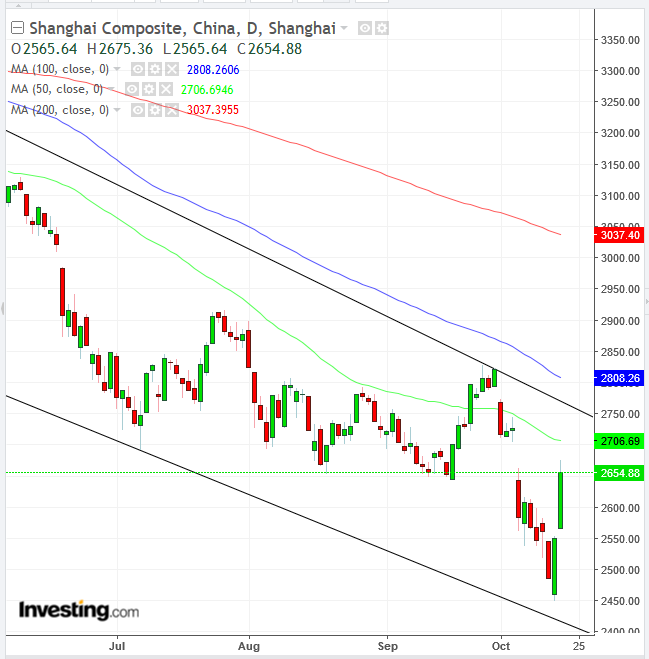 That flipped the Shanghai up 2.5% into the close, reversing a sharp downturn as China released weaker (6.5%) GDP data than expected (6.7%). Chinese exports, by the way, held steady from last quarter as they are not, so far, being affected much by Trump's tarrifs, which is actually bad because that means that there's more potential trouble for their economy ahead. In fact, exports got a boost in Q3 as shippers raced to push goods out under the tariffs, Q4 may paint a very different picture and these are only 10% tariffs – Trump wants to go to 25% and he will if he comes back in November with continued control of Congress – a good reason for China to meddle in our election! 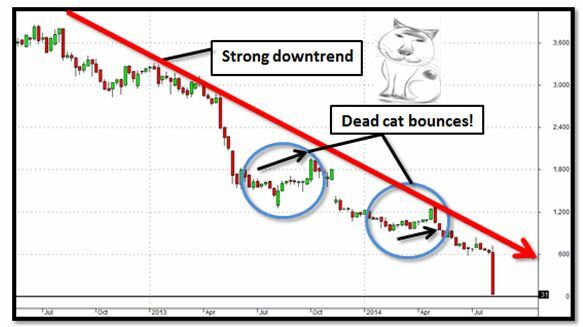 Yesterday morning I warned you not to be fooled by a "dead cat bounce" and we promptly fell off a cliff and lost a lot of our gains. 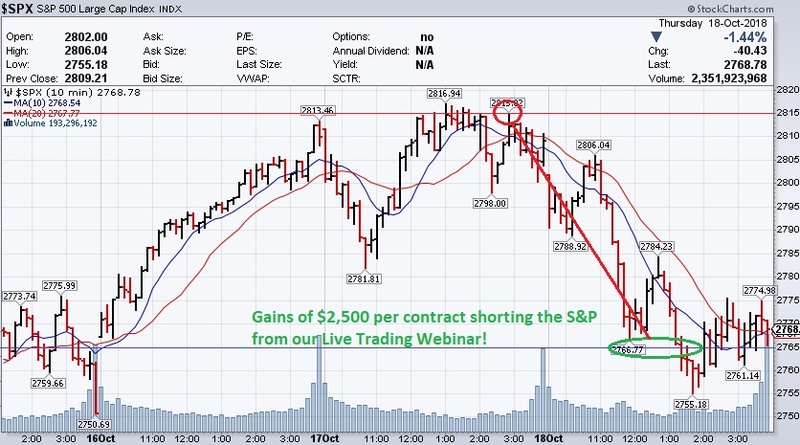 Fortunately, at 3:01 pm in Wednesday's Live Member Chat Room, I repeated our Webinar call to short the S&P (/ES) Futures at 2,815, which led to a very nice $2,500 per contract gain at 2,765 yesterday afternoon. This is why we say "Wheeeee!" when the market sells off – it's fun when you know how to hedge! You can follow our logic and learn our trading signals by watching a replay of Wednesday's Live Trading Webinar here. Of course, Schrodinger contended that the market was neither dead nor alive until you observed it but the act of observing it causes the outcome to change – that's very true in a bot-traded market where an act of programming made 6-18 months ago determines the movement of the market today as thresholds are crossed on various trading programs which, upon observation of the action, then cause the market to be more alive or more dead as they too kick in and start trading. That's why we have the 2-day rule, you have to let the various cross-currents play out before you can say you are really recovering. Take the Shanghai Composite, for example. 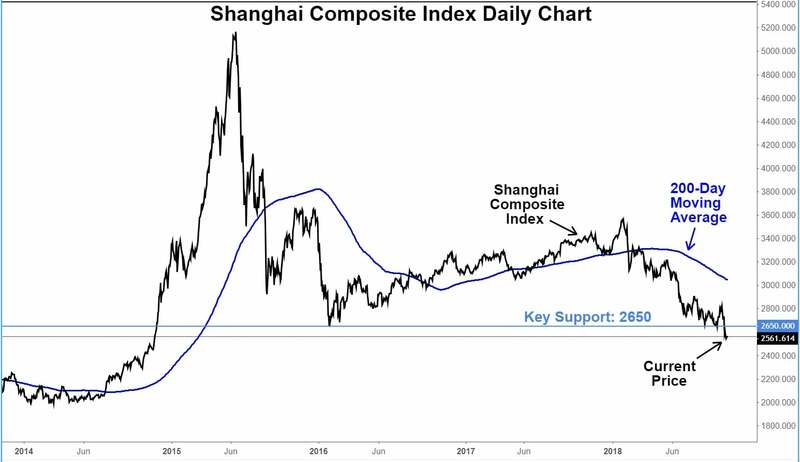 China's market looked like it was bouncing in 2015 but went lower and then made another protracted bounce that collapsed early this year and now it turns out we've been consolidating for a move lower for 3 years.